Our official meetings are free and open to anybody – we frequently have dads, expectant parents, grandparents, nannies, and all kinds of other caregivers in attendance! Babies, toddlers and older children are all welcome. One of our greatest resources is our educators, who are present at all official meetings. Our social events are usually free, but there may sometimes be an admission fee at certain locations such as community pools. If applicable, we will provide detailed information about any fees within the event description. See our calendar above for dates. This meeting features our large Lending Library of carriers. Our educators can help you select and use a carrier that you can then check out for a month with a membership or for a small fee. Or bring your own carrier for help and advice. You must park in the free uncovered parking lot east of the Ronald McDonald House; see the parking map. Enter through either the North or South Entrance. If the doors are locked, buzz the intercom and they will let you in. Once inside, take the elevator to the 4th floor, and the Community Room is the only publicly-accessible area up there (so it’s not hard to find!). Sign in with our volunteers and return lending library carriers to the Admin Desk. Mingle with other babywearing parents and caregivers. Our Welcome to Babywearing workshop is led by one of the chapter’s educators. This workshop is ideal for beginners and details safety guidelines and offers general information about the various carrier types. This workshop is geared for a more seasoned wearer and will address a specific babywearing-related topic each month. Our carrier specific workshops offer demonstrations, tips and troubleshooting of different carrier styles. Workshops are split into Ring Slings, Wraps, Meh Dais, and Soft Structured Carriers. 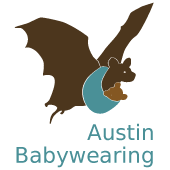 Each workshop is led by an accredited Volunteer Babywearing Educator. Please feel free to bring your own carrier to get assistance and advice from one of our educators! Make your way to the Admin Desk to check out a lending library carrier, become a member, or learn about becoming a volunteer.